Since my post on my first Android app, I've done a lot. I went on from that first app to learn how to access a lot more of the device, deal with a wider range of circumstances, and generally get to know Android and the tools for developing for it better. 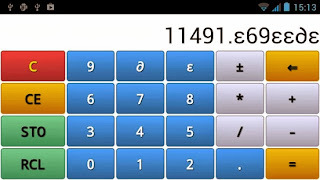 Specifically, I have posted an app for Android called DozCalc. DozCalc is a dozenal (base 12) calculator. It doesn't convert back and forth between dozenal and decimal, so be warned. Just like your normal four function calculator that works in base 10 and nothing else, DozCalc works in base 12 and nothing else. The "programming", like development in many modern GUI environments, was less about the functional code (in this case in Java) and more about the user interface. While Android allows for UI programming in Java, it's typically simpler to implement it in XML. And this is what I did. The only problem I had was dealing with loss of precision in some calculations. At first, I was going to be very clever and write a proper function using numerical analysis to get the value right to some specified number of fractional digits (note: it's not proper to call them 'decimal digits' when you're working strictly in base 12). However, it was simpler and easier to just add a small value to certain calculations (division, for example) to make all the fractional values come out correct. Far simpler to program, just as effective for this use, and every bit as accurate as the average four function calculator. Sometimes programming is less about the language, or the algorithm, than about just getting a solution that's accurate enough for the need, then moving forward. Thanks to object-oriented design, I was able to re-use the code from DozCalc in another graphical calculator. Unfortunately, I got bogged down in the graphical design, so the steampunk styled version of DozCalc (named Mr Wells' Calculator) has yet to be released, and may not be depending on how my schedule of current projects goes. I ordered an Android phone about two weeks ago. I started the online tutorials linked on the SDK's opening page. Since the SDK is based on Eclipse (my favorite full-fat IDE for Java), it was no problem getting started. I got a simple app, modified from the 'getting started' tutorial, running on an emulated Android device within an hour or so of starting. The next day--Friday, my phone arrived in the mail. It runs Android 4.1.1. After a busy day on Friday interleaved with charging and moving into the phone, I got the Android SDK talking to my phone today, downloaded an updated version of the app (a =very= simple character generator for my RPG, RoonVenture.) It ran just fine. It's very similar to my online RoonVenture Character Generator. That is, it's ugly, poorly designed, but bone-simple while producing the essential results. Android's native language is Java, with some unique libraries. So, if you're doing Java now, I recommend jumping into Android if the opportunity arises. I've found it easier to get started than with Java ME, Blackberry, or Nokia Series 60 development. Though it's worth noting that I'm coming to this with prior experience with all of those first. Now I'm taking a break from the computer and reading a hardcopy book, "Creating Android Applications" by Chris Haseman. It's written for the experienced Java programmer who doesn't need 250 pages on Java and Eclipse.